Bruno Mathsson had introduced his three basic chair models, easy, working and lounge chair Model 36, in the late 1930’s but had not finalised his thoughts on aesthetics and construction details on all three variants to his satisfaction. 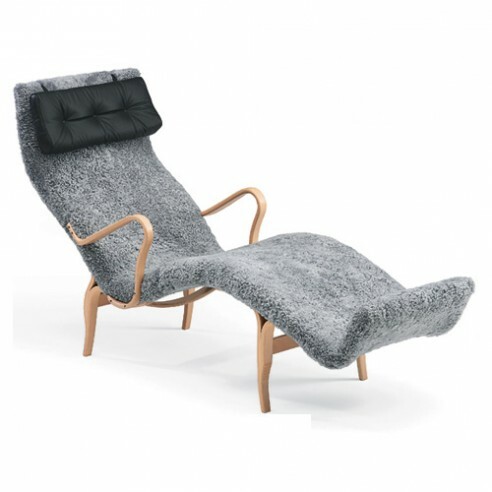 It was to take almost ten years for Mathsson to resolve matters although in 1942 Mathsson re worked the lounge chair adding arms and a longer footrest with an upward curve. and named Pernilla 3 incorporated the forward tilting head support and neck cushion first introduced in Pernilla 1 and Pernilla 2. Resting on an underarm and arms in laminated beech the solid birch frame of Pernilla 3 provides supreme comfort for extended periods of leisure. Covered in plaited webbing, sheepskin or fully upholstered in Tonus fabric or Elmosoft leather over polyether (CHMR) foam with a supporting web. When upholstered the fabric or leather is stitched horizontally with parallel seams.